Whether you're looking for adventure, somewhere to relax or you want to get back to nature, you don't have to venture far from the heart of Perth's CBD to find a wide range of leisure activities on hand. Wander around the city's attractions like the Perth Mint and Swan Bell Tower, browse the city's shopping malls and the trendy King Street strip or enjoy a cruise on the river stopping by Perth Zoo along the way. If swimming, surfing, snorkelling or just lounging at a beachside café is more your style the white sands of the famed Sunset Coast are just 20 minutes west of the city. Golfers will be spellbound by the variety of lush courses surprisingly close to the city centre, and encounters with kangaroos and emus make for a memorable 18 holes. Catch a train, join a cruise or drive to the nearby colourful working port of Fremantle. Enjoy the carnival atmosphere of street performers outside the markets, delight in the buzz of activity along the "Cappuccino Strip" or enjoy the fresh seafood at Fishing Boat Harbour. For an island experience, board a ferry to Rottnest, just 25 minutes off the coast. Enjoy the laid-back beachside holiday atmosphere, quiet coves and crystal clear waters. Or discover the Swan Valley, Western Australia's oldest wine growing region just 30 minutes east of the city. An endless choice of wineries, micro breweries, stylish restaurants, quaint cafés and art and craft galleries await to satisfy your palate and your palette. 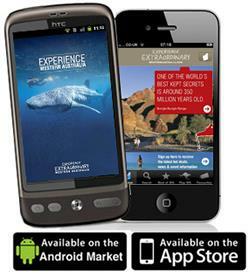 Whether you are visiting Western Australia for the first time or rediscovering this extraordinary State download your free iPhone app "Explore WA" today. With photos, videos and itineraries on each of the state's five regions you can share your favourites with friends and family via email, facebook and twitter. You can search for accommodation, events, car hire, tours and transport. Plus with four fantastic games to test your skills against WA's extraordinary wildlife and attractions you’ll start thinking you’re actually there! From towering forests to whale watching, fine food and wine to world-class surfing, Australia's South West offers some of the most varied travel experiences in Western Australia. Margaret River's outstanding wines have put it on the international map, and the area is popular all year round for forest hiking, exploring underground caves, and sampling the divine local produce in the town’s superb restaurants. Visit the pretty seaside town of Busselton, the famous Valley of the Giants Tree Top Walk in Walpole and experience a whale watching boat trip along the Southern Ocean from Albany, right up to Augusta on the Indian Ocean coast. Pristine beaches, exotic marine life, national reserves and the bluest ocean you'll see anywhere on earth can all be found in Australia's Coral Coast. Explore the unique rock formations of the Pinnacles, meet the smiling dolphins of Monkey Mia or travel to Exmouth, home of the internationally renowned Ningaloo Reef - one of the few places in the world where you can swim with giant whale sharks and manta rays. Inland is just as exciting, as carpets of wildflowers burst into colour during the wildflower season (September to November). The vast clear skies and theatrical landscapes of the Golden Outback region are the setting for true outback adventure. To experience the 1890's Goldrush, look for tours around mining towns and settlements built by pioneers. Visit the Super Pit in Kalgoorlie, one of the largest open-pit mines in the southern hemisphere, explore old mine shafts or try your hand at gold-panning. Slip into in the laid back atmosphere of Australia's Golden Outback rural life among heritage buildings, friendly pubs and hospitable farm-stays. 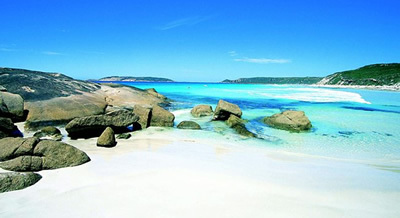 In extreme contrast, the rugged coastline and islands around Esperance offer amazing eco-experiences.